Several buildings built without permits on Ronald Ritter's land. Thank you for contacting us. Unfortunately, the address you provided is not a valid address. Please check the address. Thank you. Ronald and stevem Ritter both have farms illegally on this property. At the intersection of W Maple Road & S Hammonds Ferry Road there are at least 2 large, deep pot holes. 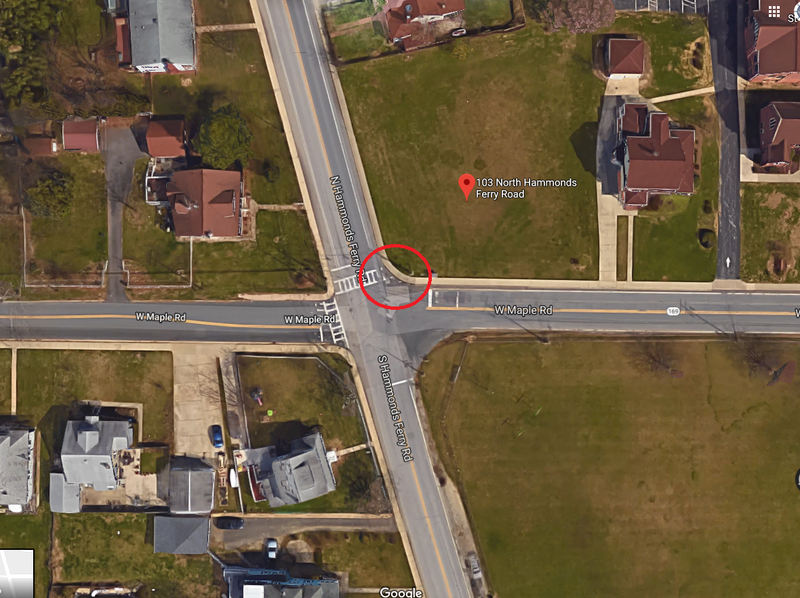 If you are traveling West bound on W. Maple road and stop at the stop light at the intersection, they will be on your right hand side, near the cross walk that goes West bound across S Hammonds Ferry. Thank you for contacting us regarding the signs. We will enter this information in our complaint database and an inspector will be assigned to investigate. If you have any questions or need further information please contact Zoning Enforcement at 410-222-7446. Thank you for contacting the Department of Public Works, Bureau of Highways regarding your pothole concern. Work order # 19405912 has been created and assigned to the Northern District Road Operations for investigation and repair. Should you need additional information on this issue please contact (410)222-6120. The left turn traffic light is not working. It is not allowing drivers to turn left onto International Dr, as it is staying Red and not signaling drivers to go. In order to get to work, I cut across 3 lanes of traffic and turned right onto International Rd and then went straight across thru the light to get to my destination. Other drivers were doing so as well, which could end up causing an accident as it is not the safest solution. Thank you for reporting this issue to Anne Arundel County. A crew will be dispatched to investigate. Should you have any further questions or concerns at this time, please contact the Traffic Maintenance Shop at 410-222-1940, thank you! Left arrow traffic signal is not functioning/cycling through the traffic rotation. The arrow is staying Red and not allowing drivers to go at all. I sat thru 5 cycles this morning waiting to turn left onto international rd. Thank you for notifying Anne Arundel County Animal Care & Control of the carcass on a County road. Carcasses are typically within removed with 24 hours (on weekedays) of the carcass being reported and acknowledged. Carcasses are removed on weekdays during normal business hours. Carcasses are not removed on weekends or evenings, carcasses reported in the afternoon may not be picked up until the next business day we apologize for the inconvenience. If you have not received an acknowledgement please call us at (410) 222-8900 so we can ensure removal is going to occur. An RV & Recreational Trailer have been parked in the Hammonds Ferry Park & Ride for months with people living out of them. This is clearly in violation of the rules of use of the Park & Ride. Anne Arundel County Admin assigned this issue to Constituent Services - James R.
Well, the problem has gotten exponentially worse. Another 3 vehicles can be added to the permanent encampment at the park and ride without any hope of having it dealt with. I guess I voted for the wrong person to address the issues around here.